I was quoted in an article entitled “Bristol-Myers Squibb swallows last of antibody pioneers”, by Malorye Allison, in the September 2009 issue of Nature Biotechnology. The article focused on the monoclonal antibody sector, especially on the acquisition of Medarex by Bristol-Myers Squibb (BMS). The acquisition was completed on September 1. To read the article, go to http://www.nature.com/nbt/journal/v27/n9/full/nbt0909-781.html (subscription required). In January, I gave a presentation to an RNAi conference, drawing lessons for the current therapeutic RNAi field from the evolution of the monoclonal antibody (MAb) field. This was discussed in a previous blog post, which focused on technological prematurity. In this blog post, we discuss the evolution of the MAb sector, how industry leaders emerged, and the acquisition of these leaders by large pharmaceutical and biotechnology companies. MAbs are now the fastest-growing and most successful class of biologics. The majority of the MAbs on the market are indicated for oncology and inflammatory diseases. In 2005, MAbs accounted for 75% of antitumor biologics sales ($7.3B). Fueled by expanded indications and new products, MAbs are the major growth engine of the biologics sector, now and into the foreseeable future. Moreover, as we discussed in another previous blog post, leading biologics (all of which are MAbs) are on track to be the biggest-selling drugs in 2014. Large pharmaceutical companies thus have been seeking to acquire this highly successful class of drugs (including both marketed and pipeline MAbs), in order to fill their depleted pipelines and to make up for lost revenues due to current and impending patent expiries. However, the MAb field was not always successful. Therapeutic MAbs went through nearly 20 years of scientific/technological prematurity. The period of technological prematurity of MAbs lasted roughly from 1975 to 1994. Georges Köhler and César Milstein published the first paper on MAb technology in 1975, and they received a Nobel Prize for their work in 1984. The first MAb drug, Johnson & Johnson’s Orthoclone OKT3 was approved in 1986 for use in transplant rejection. However, this drug can only be used once in a patient due to its immunogenicity. There were not any further approvals of MAb drugs until 1994. The “deluge” of MAb drug approvals began in 1997, and has accelerated ever since. Prior to 1994, MAb technology represented great science, and it enabled researchers to make great strides in immunology, cancer research, the biology of HIV/AIDS, and other fields. (Some of this research was eventually applied to drug discovery, including the discovery of MAb drugs.) But during this period of scientific prematurity, any MAb drugs seemed to be in the distant future. However, beginning in the early 1980s, several companies and academic labs began to develop enabling technologies designed to move this premature technology up the development curve. Among these companies were those that became the leaders In the MAb field. The original MAbs were made via fusion of mouse B cells with murine myeloma cells, to create hybridomas. The MAbs secreted by these hybridomas contain all mouse sequences. They are highly immunogenic in humans, and are usually rapidly cleared from the circulation. They may also trigger allergic reactions and in some cases anaphylaxis. In order to create less immunogenic MAbs with the potential for efficacy and safety in humans, researchers used recombinant DNA technology to construct MAbs with mainly human sequences, but with the specific antigen-binding site of a mouse MAb. Development of fully human MAbs required the invention of special technologies (phage display or the humanized mouse) that do not rely on mouse hybridoma technology. Among leading fully human MAb companies, Cambridge Antibody Technology utilized phage-display technology, and Abgenix and Medarex used humanized mouse technology. The great majority of marketed MAb cancer drugs are chimeric or humanized MAbs. The first fully human MAb cancer drug was approved by the FDA in 2006. The development of MAb enabling technologies began in the early 1980s (early within the period of technological immaturity of MAb drugs). For example, Genentech’s broad Cabilly patents (issued in 1989 and 2001) resulted from the company’s collaboration with academic researchers beginning in the early 1980s. But Genentech’s first MAb products, the antitumor agents Rituxan (codeveloped with Idec) and Herceptin, did not reach the market until 1997 and 1998, respectively. Both are highly successful drugs. The MAb sector has been characterized by a high degree of litigation over enabling technology patents (e.g., Genentech’s Cabilly patents vs. UCB Celltech’s Boss patent), and a great degree of cross-licensing of enabling technology patents, in part to settle or prevent lawsuits. From this history of technology development, patent disputes and cross-licensing, several MAb sector leaders emerged. Over the course of the last several years, all of the public biotechnology companies that pioneered therapeutic MAb technology and become leaders in the field have been acquired. The acquisition of Medarex by BMS brings this process to a conclusion. Are there any MAb companies that have yet to be acquired? 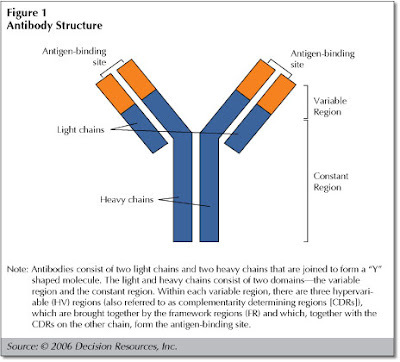 The Nature Biotechnology article mentions several companies developing antibody conjugates, antibody fragments or antibody mimetics. However, there are also other still-independent firms that have developed proprietary technologies to produce full-length humanized or fully human MAbs. Among these are Facet Biotech (humanized MAbs), and Xoma, MorphoSys, BioInvent, and Dyax (all of which developed fully human MAb platforms based on phage display technology). Of these companies, Dyax is currently focusing on development of its proprietary non-antibody lead product, but also has a pipeline of proprietary research-stage MAbs and partnered research-stage and Phase I MAbs. The other companies are focusing solely on MAbs, and have pipelines of proprietary and partnered MAb drug candidates. Of these companies, MorphoSys appears to have the strongest technology platform, and has used this platform to craft a unique business model that enables the company to be profitable even though it has not yet marketed a drug. Facet Biotech was spun out of PDL BioPharma last year. PDL, formerly known as Protein Design Labs, is a pioneer in humanized antibody technology, whose technology was used in the development of Genentech’s Herceptin and Avastin. In August 2009, Biogen Idec made an unsolicited offer to acquire Facet, which Facet rejected; the attempt of Biogen Idec to acquire Facet is still ongoing. Biogen Idec has been Facet’s partner since 2005, and the two companies have been codeveloping daclizumab, an anti-IL-2 receptor agent for treatment of multiple sclerosis (currently in Phase II clinical development), and volociximab, an anti-angiogenesis agent for treatment of solid tumors (also currently in Phase II). Except for Facet, none of these companies appears to be a near-term acquisition candidate. Nevertheless, large pharmaceutical companies are continuing to work on building franchises in biologics, with an emphasis on MAb drugs. This is, for example, a factor in the Merck-Schering Plough and Pfizer-Wyeth mergers. Schering-Plough has had MAb alliances with such companies as MorphoSys and Xoma, and acquired Dutch company Organon (which had a collaboration in MAbs with Dyax) in 2007 in part because of its capabilities in biologics. Merck also acquired GlycoFi in 2006, for its capabilities in yeast-synthesized MAbs and other biologics. The newly merged Merck plans to make biologics a major focus of the company. Similarly, Pfizer acquired Wyeth in part because of its strength in biologics. 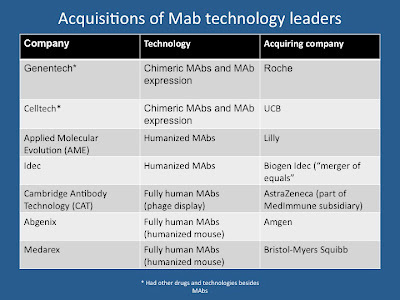 Thus, the acquisitions of the leaders in MAb technology represent an important part of a larger picture, the growing emphasis on biologics in large pharmaceutical companies, which have traditionally relied on small-molecule drugs. Haberman Associates has joined Innovalyst as an Affiliate. Innovalyst is a North Carolina-based consulting consortium. It is led by four Managing Partners with over 20 years of industrial experience as executives at top-tier pharmaceutical or biotechnology companies. Innovalyst’s Intellectual Capital Advisory Network (ICAN) also includes over 75 Affiliates with an extraordinary breadth and depth of life science business skills. Since 1997, Haberman Associates has been a member of the Biopharmaceutical Consortium (BPC), a Boston-based life science consulting network. We shall continue to maintain our membership in BPC, and our Boston-area location. However, we shall also expand our network to include Innovalyst. In addition to Haberman Associates, another BPC member, Trilogy Associates (headed by Joseph Kalinowski), is both a member of BPC and an Innovalyst Affiliate. Trilogy relocated to North Carolina in 2008. Haberman Associates will maintain its primary focus on science and technology strategy, and on new product development via internal R&D and partnering. However, we shall be able to draw on our partners in BPC and Innovalyst to form project teams to take on larger, more complex projects requiring multiple areas of expertise, especially for large pharmaceutical and biotechnology companies. We shall also continue to serve life science clients of all sizes, from start-ups to major corporations. If you have any questions about Haberman Associates and its expanded consulting network, or would like to discuss your company’s needs, please contact me. In a previous blog post, we talked about the role of metabolic engineering and synthetic biology in facilitating a return to natural products as drug candidates in drug discovery and development. In the August 13 issue of Nature, George Church (Harvard Medical School) and his colleagues reported on their new method for accelerating the optimization of metabolic pathways to produce medically and industrially useful natural products. The Church group calls its technology Multiplex Automated Genome Engineering (MAGE). MAGE is an efficient, inexpensive, automated system to simultaneously modify many targeted chromosomal locations (such as genes or regulatory elements) across a large population of cells, through the repeated introduction of synthetic oligonucleotides. A bacteriophage-mediated homologous recombination system is used to replace the targeted sequences with sequences of the introduced oligonucleotides. As the result of this process, researchers obtain a heterogeneous, highly diverse population of cells. Researchers may subject this population to selection for a desirable property, such as more efficient production of a desired product. The selected cells may then be subjected to additional rounds of MAGE, followed by additional rounds of selection. The result is the evolution of strains that efficiently produce the desired product. These strains may be scaled up to produce the product for research or commercial purposes. The Church group chose to demonstrate their MAGE technology by optimizing a pathway in Escherichia coli for production of the carotenoid lycopene (the red pigment found in tomatoes and watermelons, which is valued as a nutraceutical). These researchers’ approach to utilizing and optimizing this pathway builds upon the work of leading metabolic engineers Jay Keasling (University of California at Berkeley) and Gregory Stephanopoulos (MIT). Carotenoids such as lycopene are members of a larger class of compounds called isoprenoids. Another class of isoprenoids is the terpenoids. As discussed in our previous blog post, terpenoids include numerous marketed natural product drugs, and this class of compounds is also of interest to researchers interested in discovering novel drugs. Because of common pathways for biosynthesis of precursors of carotenoids and terpenoids, Church’s work on optimizing production of lycopene in E. coli is relevant to researchers interested in applying synthetic biology to the synthesis and study of terpenoid drugs. The pathway in E. coli (and in other prokaryotes) for synthesis of isoprenoids is known as the DXP (deoxyxylulose-5-phosphate) pathway. This is in contrast to the better-known mevalonate pathway, which is found principally in eukaryotes and in archaea. We discussed Dr. Keasling’s engineering of the mevalonate pathway in yeast and in E. coli (the latter of which was engineered to express this exogenous pathway) to produce terpenoid drugs in our 2007 synthetic biology report. A review of work on metabolic engineering of both the mevalonate pathway and the DXP pathway by the Keasling group and by others can also be found in a 2007 paper by Drs. Withers and Keasling. In order to utilize the E. coli DXP pathway to produce lycopene, researchers must engineer the bacteria to express the enzymes that catalyze the final steps in lycopene biosynthesis (i.e., the three enzymes that convert the final product of the DXP pathway to lycopene). The Church group transfected their starting E. coli strain with a plasmid containing the genes (derived from another species of bacterium) for these three enzymes. The resulting E. coli strain produced lycopene at a basal level. It was that strain that the researchers subjected to MAGE. The researchers used the MAGE system to target each of 20 endogenous E. coli genes in the DXP pathway. For each gene, they designed 90-mer oligonucleotides that contained variants of the gene’s ribosome binding site (RBS), in order to replace the endogenous RBS with one that would give more efficient translation of mRNA into protein. They also designed oligonucleotides to knock out four endogenous genes that encode enzymes that siphon off intermediates from the DXP pathway, in order to increase the flux through the DXP pathway to improve lycopene production. The total pool of oligonucleotides was in the hundreds of thousands. The goal was to optimize 24 genes simultaneously in order to achieve maximal lycopene production. The researchers added the cells and oligonucleotides to the MAGE system, cycling the cells through oligonucleotide delivery (via electroporation), growth, and washing cycles, yielding billions of genetic variants per day. Every 24 hours, the researchers selected the variants that produced the reddest colonies, and thus the most lycopene. After only three days, the procedure yielded variants that exhibited a fivefold greater lycopene production than the starting strain, with a greater yield (approximately 9,000 micrograms per gram dry cell weight) than previously documented. E. coli strains with an optimized DXP pathway, as developed by the Church group, could in principle be used to produce other isoprenoid compounds, including terpenoid therapeutics. In order to do so, researchers would need to transfect specific sets of genes to carry out the final steps of the biosynthesis of their desired compounds into the strains, instead of the specific lycopene biosynthesis genes used by the Church group. They might also use methods such as the “designed divergent evolution” technology developed by the Keasling group, to develop variants of enzymes that carry out the final steps of the biosynthesis of terpenoids, in order to discover novel terpenoid drugs that are not found in nature. MAGE, which allows researchers to simultaneously optimize the expression of large sets of genes in a metabolic pathway, contrasts with traditional metabolic engineering, which is typically a slow process in which genetic constructs are introduced into cells one at a time. It thus represents a potential advance. However, as in the above MAGE-based optimization of lycopene production, applications of MAGE to natural product drug discovery and production will build on the work of metabolic engineers who use more conventional methods.